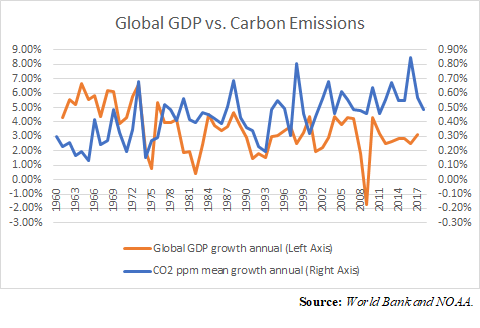 Global carbon emissions continue to grow even as the global economy, population and labor force continue to slow down, showing that “green” policies designed to curb economic and population growth are having almost no impact on achieving the stated goal of reducing carbon emissions. In 2018, carbon dioxide in the atmosphere rose to 408.52 parts per million (ppm), according to National Oceanic and Atmospheric Administration (NOAA). In the meantime, the global economy has continued to slow down, according to data compiled by the World Bank, averaging 4.1 percent growth a year from 1961 to 1991, but then dropping to 2.8 percent annual growth for 1992 to 2017. Similarly, the growth of the global labor force — those working or looking for work — has slowed, averaging 1.7 percent from 1992 to 2005, and then just 1.1 percent from 2006 to 2018. So, too, has the overall growth the world’s population slowed down, once averaging 1.86 percent annual growth from 1961 to 1991, before slowing down to 1.3 percent average annual growth from 1992 to 2017. It has been more than 20 years since the Kyoto Protocol was signed, and almost three years since the Paris climate accords were implemented. But other than commitments from partner countries to reduce carbon emissions, not much has been accomplished on that front. Carbon emissions are still accelerating. Another unknown is what technologies might be developed that could supplant carbon-emitting fuels if economic growth was occurring more rapidly. What if regulations in advanced economies designed to reduce carbon emissions were inhibiting the very growth that might produce more efficient energy sources? In the meantime, those very regulations tend to create cost advantages for developing countries like China, fueling rapid industrialization there, and in turn accelerating carbon emissions. All of which calls into question what, if anything, the policies are actually achieving. Besides harming the economy and redistributing global wealth to developing countries, that is. The Panel also calls for “[s]trengthening the capacities for climate action of national and sub-national authorities…” in order to avert what it views as catastrophic global warming, per its report. So, economies will continue to be transformed via “system transitions” to green energy that will be directed by national authorities with increased powers to implement the green political program. If it sounds somewhat vague that’s probably the point. In short, that means fewer choices, fewer opportunities and more dictates coming from on high until governments hit the numbers they’re hoping for on carbon emissions, if ever. Vox.com’s Roberts notes that green programs hit roadblocks when conservatives won elections in the UK in 2009 and Republicans began to take back Congress in 2010 from total Democratic control. So, the obstacles to the “Green New Deal” are: 1) continued economic growth, even if it is slowing, particularly in developing economies, but also everywhere else; 2) a growing population with greater energy needs, even if its growth is continuing to slow; and 3) party politics that prevent these unpopular policies from being fully implemented. Meaning those touting pushes to reduce carbon emissions are being frustrated not only by the slowness by which democracies make decisions, but also by economic and demographic realities. Since the industrial revolution, the world’s population has exploded as mechanization has led to abundance in agriculture, transportation and construction. All of which was fueled by the dramatic increased use of carbon-emitting fuels. It stands to reason, that to reduce the incidence of carbon emissions, one way would be to reduce the number of carbon emitters. Hopefully the true believers have not come to that realization yet. 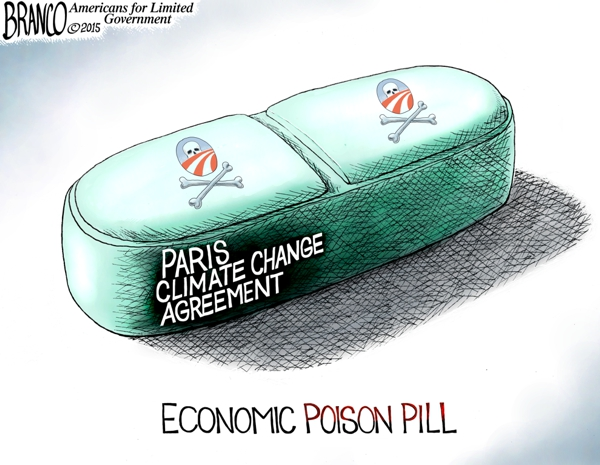 But to be sure, the policy is failing, as evidenced by the acceleration of carbon emissions growth, even as advanced economies take it upon themselves to slow down their growth and attempt to regulate coal and oil out of usage. Instead, the cost advantages generated are fueling growth elsewhere via globalization, leading to more carbon emissions. On the whole, political ideologies do not tolerate obstacles for very long. Eventually, this will lead to a call for action. The obstacles must be removed. And make no mistake. Those pushing for the “Green New Deal” are calling for a revolution. The question is just how much of our freedoms are in the crosshairs? Robert Romano is the Vice President of Public Policy at Americans for Limited Government.